Kate Denny | The Goose Is Out! 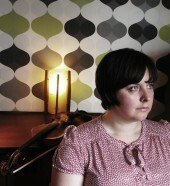 We first came across singer, composer and fiddle player Kate Denny as a member of The Kittiwakes, now sadly disbanded. Her solo work since then has gone from strength to strength. In 2012 we had a really great evening with Kate Upstairs at the Mag, accompanied by the equally excellent Charlie Skelton on guitar, fiddle and pipes! Kate’s voice has been described as both ‘striking’ (fRoots) and ‘lullaby-like’ (Mojo) bringing depth and range of expression to her songs and tunes that are haunting, poignant and whimsical. Her solo album ‘Closer to Home’ focuses her writing on matters closer to heart and home. Wherever Kate sings, you can expect songs of tragedy and injustice, love and hope – and the odd talking bird thrown in for good measure! Kate captivates audiences with the stories she weaves and gorgeous fiddle based tunes. She certainly captivates us! Click here to find out more about Kate Denny! Click here to find out more about The Kittiwakes!